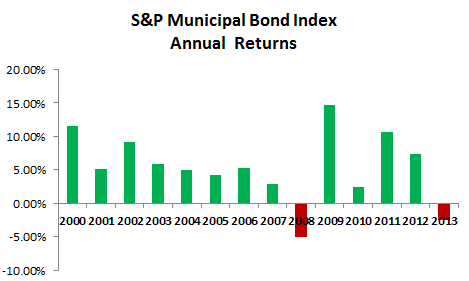 Since the S&P Municipal Bond Index was launched in 2000 it never has had two years in a row of negative returns. However, a new year begins with all the uncertainty and expectations of any other year. Municipal bond funds are entering 2014 following a long string of monthly cash outflows indicating that retail investors remain skeptical of the short term prospects of the muni market. Puerto Rico: The S&P Municipal Bond Puerto Rico Index was down over 20% in total return in 2013. Puerto Rico bonds hang on a precipice of a down grade by Moody’s, S&P or Fitch to below investment grade. A downgrade by any one of those ratings providers would most likely continue to foster the junk bond trading environment that these bonds face today and make it more difficult and costly for the Territory to borrow in the future. On average, bonds in the S&P Municipal Bond Puerto Rico Index trade at higher yields than corporate bonds in the BB rated category. Who is hurt the most? Investors in bond funds with high exposure to triple tax-exempt Puerto Rico bonds. High profile defaults: The City of Detroit bankruptcy filing in 2013 followed other headline making defaults in 2012. While representing a very small fraction of the municipal bond market, these defaults have been powerful reminders that buying bonds is simply lending money in anticipation of being repaid on time and in full. In reality, new monetary defaults, as tracked by the S&P Municipal Bond Index totaled 19 bonds so far in 2013, down from 30 bond defaults in 2012. Tapering and rising risk free rates: Bonds in general, particularly long term bonds, are impacted negatively by rising interest rates. Investor rotation to shorter duration bonds in anticipation of rising rates began in 2013. The prices of shorter term bonds simply move less given a change in interest rates then do longer term bonds. A possible increase in demand for short term bonds can be expected in a rising interest rate environment. Rising interest rates should negatively impact the demand for longer term municipal bonds. New issue supply: Municipalities have decreased their new issue borrowing in 2013. Supply of new issues is difficult to predict but an increase in supply without a parallel demand increase would potentially weigh heavily on the municipal bond market. Transaction costs: It is not easy to buy bonds as the transaction costs of buying individual bonds can be hard to figure out. This cost can erode the returns of holding individual bonds. According to our statistical studies, the transaction cost for high grade bonds in the S&P National AMT-Free Municipal Bond Index has been approximately 170bps each way (buy and sell) for bond trades of $100,000 par value and lower. In the past, during down markets, we have seen that transaction cost rise. If the market gets weaker in the future, the possibility of higher transaction costs for retail positions can be expected. Source: S&P Dow Jones Indices LLC. Data as of December 31, 2013.